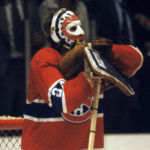 Dave Dryden split the 14 seasons he played as a professional goaltender between the National Hockey League (NHL) and the World Hockey Association (WHA). Since the Edmonton Oilers were part of the World Hockey Association for most of the years he spent with them, he appeared in more NHL games as a member of the Buffalo Sabres than any other team. While Dave was off to a fresh start with the Sabres in 1970, his parents, Murray and Margaret Dryden, were off to a fresh start of their own. That year they founded Sleeping Children Around The World, an organization that provides bedkits to children in underdeveloped and developing countries. “Well, I remember when I was playing with the Sabres and Dad was talking about this idea. He didn’t really talk about it much the first couple of years, he wanted to sort of see if it could work, I think, before he even mentioned it to Ken or I or my sister, Judy,” explained Dave Dryden. “When he started it and told me about it I thought it was a neat idea, but I was unsure of how much it was going to accomplish. In every way we were supportive but we weren’t involved, simply because we were involved in our own lives at the time,” he continued. As something that started off so small with distributions of 50-100 bedkits, Sleeping Children Around The World has been able to grow over the years and donate more and more bedkits to underprivileged children around the world. Dave believes that it wasn’t only the hard work that his parents put forth to make Sleeping Children the success that is today, but it was also the passion that they had for what they were doing. “As I’m finding now, when I go around and see people who knew my dad back in those early days, he really did motivate them to get involved. He was very passionate about what he did, very ethical and very upfront and he made people want to help out,” explained the Hamilton, Ontario native. “I’m in a position now where maybe 75 or 80 times a year I’m out going to churches or rotary clubs to speak to people about Sleeping Children and so many times people will come up to me and tell me about how my dad spoke to them 25 years ago and they still remember it and I think it’s great. I’m learning a lot about my mom and dad right now than I would normally know because these are people that saw them in a difference perspective from how I saw them,” he continued. Dryden may not have understood his parents’ passion when this all began when he was younger, but throughout the years, as the President of Sleeping Children, he has really started to understand why they started it in the first place. The passion that his dad once had for Sleeping Children is now being mirrored through him. Dave’s favourite thing to do through Sleeping Children is going overseas to give out the bedkits. It usually takes 2-3 weeks to distribute all of them, but it’s a unique experience. Throughout the years Sleeping Children has given out kits to nearly 1.3 million children. The kits go a long way because they can benefit the entire family and a lot of the stuff can be handed down to younger children. “The biggest impact that I see is that a bedkit is given to a child and a family. It has bedding, clothing, school supplies and mosquito net. Right off the bat the mosquito net is going to be something that the entire family can use because it’s so large. You give them the bedding and you just know that a lot of them are going to get a better night’s sleep because many of them were sleeping on the floor and on the mud,” stated Dryden. “Their parents tell me they get a better night’s sleep and you and I both know how much better we feel after a decent sleep. Our thing is, if a child is safe and healthy and getting a good night’s sleep, you want them to get up in the morning and do whatever they need to do so that they end up, you know, maybe getting out of the poverty trap,” he continued. Each year, Dryden and members from Sleeping Children return to areas that they previously visited to see the kind of impact that the kits have made. Dryden enjoys going to the distribution sites to give out the kits because he gets to see the smiles on all the faces. “What we do is we get our team to unpack a bedkit to hold up all of the different items so that the kids and parents can see what they’re getting and we let them know everyone will get the same item so there’s no scrabbling or anything like that, and the cheering that goes on is unreal,” he explained. For an organization that Dave Dryden wasn’t too sure of in the beginning, it now amazes him how much of a difference his parents were able to make. He understands the vision that they had when they first started Sleeping Children Around The World and it’s safe to say he now shares the same one.